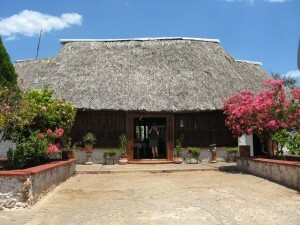 Leaving Uxmal we discovered a restaurant that surely relied upon the tour buses that visit Uxmal. In fact, two pulled in after (thank goodness!) we had already ordered. Most of the [other] tourists were Russian. The bus driver (fluent in Russian and Spanish) explained to us that the tour had originated in Mexico City and was touring all of the major archaeological sites in Mexico in a whirlwind of sightseeing. As we ate, my eyes wandered to the traditional altar set up by the bar. I asked for and was given permission to take a photo of the altar. The waiter told us that the man in the middle is the founder of the restaurant and the father of the current owner. 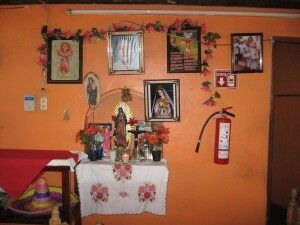 The photo of the women to the right of the altar are owner’s mother and sister. The virgin on the altar is dark skinned; a beautiful connection to indigenous roots. I couldn’t tell if others noted this traditional feature of Mexican culture. It certainly helped to identify this establishment as “authentic” for me. And close by we made another stop and found a very similar building designed for tourists; this one offering the usual tourist objects as well as gourds made on site as their “unique” offering to the tourist community passing by. 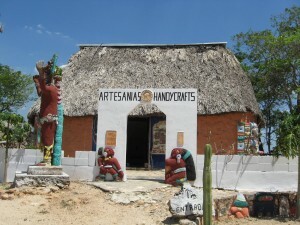 As did the ancient Maya, the proprietors of this shop offered objects made from natural resources like obsidian and jade, the raw materials imported from all over Mexico. Jo bought a beautiful carved gourd.